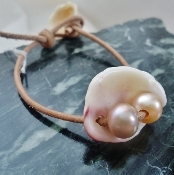 Simple and Natural, this bracelet is the perfect complement to the "Naturalist" Necklace. Pearl and Leather color are customizable in the down drop menus. These simple and timeless drop earrings will capture your love of the beach and nature and share it with all who see you! 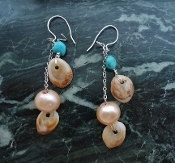 They are a fun and versatile way to combine something natural with something luxurious.